Caramelized onions make these veal steaks extra-special. Serve these steaks with a tossed green salad and rice or baked potatoes for a great family meal. In a skillet, heat olive oil and butter over medium heat. Add onions and cook, stirring frequently, until nicely browned, about 20 to 30 minutes. Coat a grill pan or large skillet with olive oil; place over medium-high heat. Rub steaks with the cut sides of the garlic and sprinkle with salt and pepper. Cook the steaks for about 2 to 3 minutes on each side, or until done as desired. 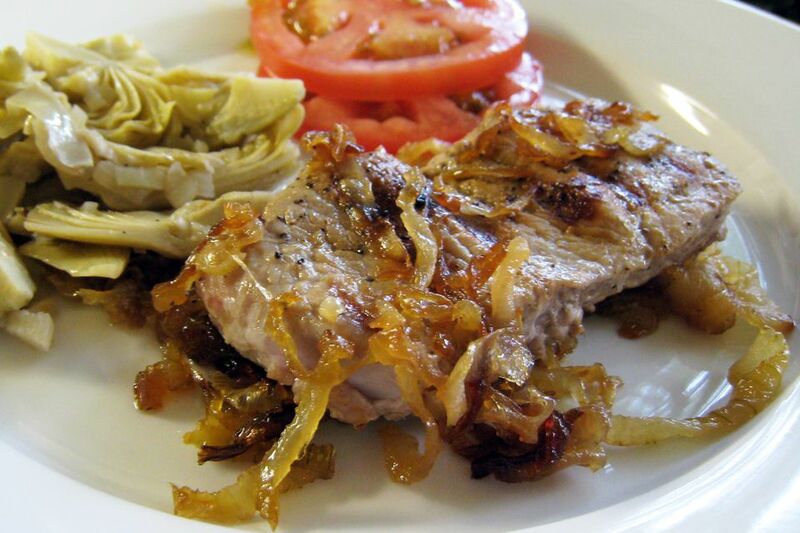 Serve veal on a thin bed of caramelized onions and sprinkle with more strands of the caramelized onions.